Caption slip reads: "Photographer: Gaze. Date: 1952-06-06. 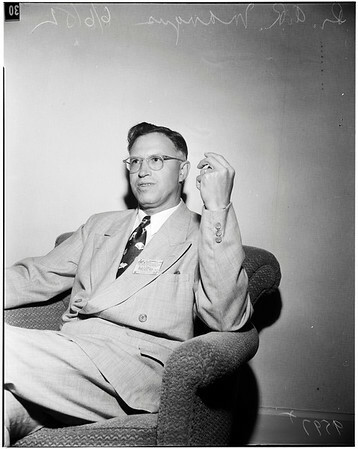 Reporter: Stan Dunn. Assignment: Probation convention. #29-30: Doctor A.R. Mangus, research sociologist, Langley Porter Clinic, San Francisco, principal speaker today at California Probation and Parole Association conference, Santa Monica".